Home / Blog / Meet Maria! We are so thrilled to introduce you to Maria Regina Inestroza. Maria is Pure Water for the World’s Country Director in Honduras. We have been working with Maria since 2012. Her passion for the health and well being of the children in Honduras is truly extraordinary! Even though we have worked with Maria for the last six years, we learned so much about her through her interview questions. We hope you are as inspired by Maria’s life and work as we are! 1 Tell us about yourself! Maria Regina Inestroza is to proud serve the most vulnerable communities in her homeland. Born and raised in Tegucigalpa, Honduras, Maria earned her degree as an Environmental Engineer from Catholic University. 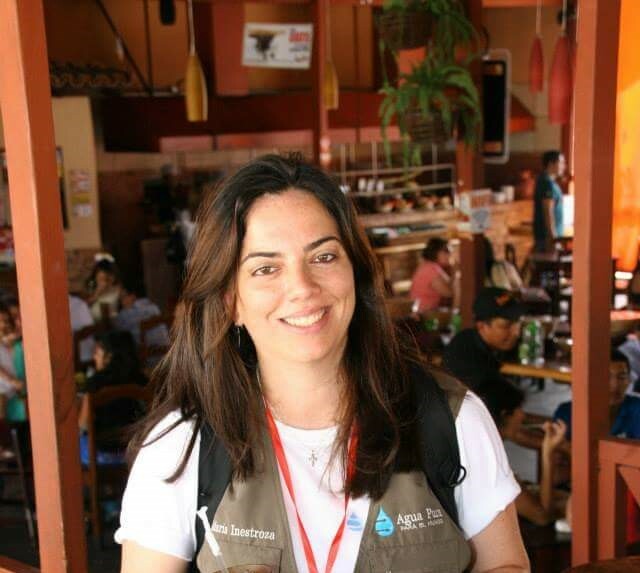 She has 15 years of experience in the water and sanitation sector, serving as PWW’s Country Director for Honduras since 2007 and joined efforts with Tailored for education 2012. Maria’s passion for society, water, hygiene and sanitation arose after a devastating hurricane struck Honduras in 1998. Following the hurricane, she volunteered for a foundation that protects the watershed that provides water to Tegucigalpa and surrounding communities. This experience inspired her to become a WASH professional. Maria is an active member of the Nueva Tegucigalpa Rotary Club, where she has served as President of the club, President of WASH in Schools Challenge for her District, and is currently her club’s Foundation Chair. Maria sees her top accomplishments as having the “Antonios” (her husband and son) in her heart and life, her family, and the opportunity to share her passion of health and development with the families of Honduras. 2. How has education impacted your life? Is there a specific memory and/or person that influenced you? I am the middle child of five, it was a challenge for my father and mother to be able to send us to school, the two oldest went to bilingual school and the 3 youngest including me had attend an only Spanish school, do to economical constrains a large family brings our parents could not enrolled us all in the bilingual school. Luckily enough when I was in fifth grade, my dad obtained a scholarship through the Central Bank that allowed him to study in the United States and bring his family along. Where he enrolled us in public school in the United States. That first year in the USA, that I will always remember and has had a big influence in my life, was my ESL teacher (English as a second language) Mrs. Metz. She showed me that perseverance, dedication and the need to communicate, are your best of friends when communication is the barrier to obtain what you want. It has changed my life tremendously, it took 6 month to speak fluently and another year to level me to the English of my classmates, I simply worked extremely hard to get good grades and fit in not only to make my Mom and Dad proud, but also in order to make myself and Mrs. Metz proud. I’m very grateful for the opportunities, that God and my education has given me and my family. I would not be able to support my family now or have obtained any jobs I wanted such as the one I have now, if it wasn’t for the education and knowledge I received not only in my youth but throughout my University years. I can only do my best to give that kind of education to my son now, through PWW I help other kids attend school by having water, menstrual hygiene management and sanitation infrastructure in their schools and homes and through Tailored for Education through the uniforms to attend school and their parents to be able to purchase schools materials with the saving this brings them. 3. What is your hope for girls around the world? My hope for girls around the world in that they have the same opportunity that I had to study and be able to feel good about themselves and the next generation of girls. A place where they feel appreciated, secure, loved and respected. 4. What inspires you about Tailored for Education? The humbleness and passion, and willingness of their funders to join efforts through partnering with organizations such as PWW and others, that are already doing sustainable services for families in need and that their organization Tailored for Education inspired me personally because it provides relief for parents that where considering not enrolling their kids at school because they didn’t have enough money to purchase a uniform and also hope of a better future for children to be able to obtain education. By providing uniforms to children in need Tailored for Education is making a great difference in a child’s faces, it makes them feel good and it makes them smile but most of all it makes them continue with their education. 5. What advice that you would give your 12 year old self? Maria always take chances they never come twice, always help those in need and don’t be afraid. Everything is going to be OK, If someone happens to criticize you, don’t listen to them and you are the only one responsible for your acts! Follow this inner real you and you will be richly rewarded with the life you never dream of having.